True living legends are few and far between, but Ihsahn has long since earned the right to be regarded as one of metal's all-time greats. As frontman and chief songwriter with legendary Norwegian black metal pioneers EMPEROR, he swiftly cemented a formidable reputation as one of the underground's most idiosyncratic creative forces. Classic albums like 1995's "In The Nightside Eclipse" and 1997's epoch-shattering "Anthems To The Welkin At Dusk" ensured that the young band were among the most respected the most popular of Norway's many black-hearted exports. Their imperious rise to prominence came to an unexpected end after the release of 2001's wildly intricate and grandiose "Prometheus: The Discipline Of Fire & Demise", but it was an album that suggested that Ihsahn's compositional journey was far from over. Reincarnated as a solo artist for 2006's "The Adversary", Ihsahn has spent the last 12 years forging a second path through artistry's darkest shadows; one that is making more and deeper connections than any of his past endeavours. With a sound that still retains strong links to his black metal roots while embracing everything from skewed art rock and avant-garde jazz to experimental electronica and dark ambient, each successive album has presented a brand new manifestation of the Norwegian's unique craft: from the muscular and haughty riff sculptures of "Angl" and "After"'s haunting, saxophone-driven mirage to the tech-metal explorations of "Eremita" and on to the wild, avant-metal splurge of "Das Seelenbrechen", Ihsahn's catalogue speaks of a restless creative spirit with ideas to burn. 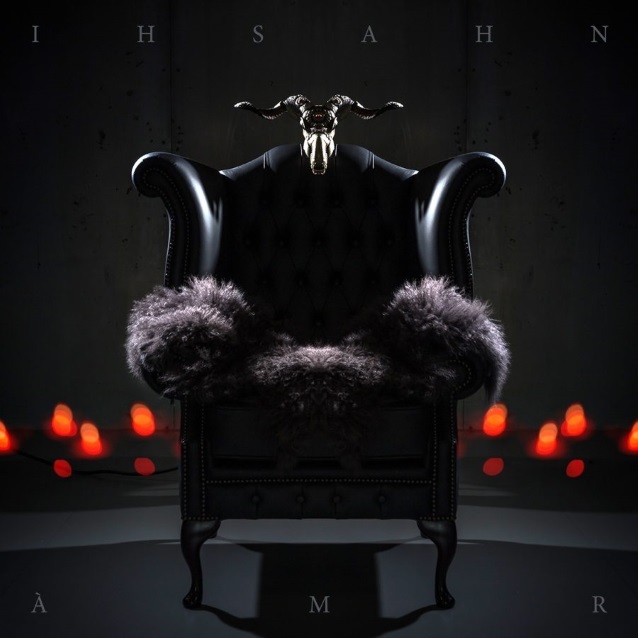 In keeping with that spirit, 2018 brings the arrival of Ihsahn's seventh solo album, "Ámr". Another immersive and frequently disorientating eruption of refined and absorbing progressive extreme metal, it echoes the meticulous precision and structural simplicity of 2016's widely acclaimed "Arktis". Album while taking Ihsahn's music somewhere entirely new, where the hiss and throb of old school analogue synths dominate and the atmosphere is airless and oppressive. Once again percussively propelled by longtime drummer Tobias Ørnes Andersen and with a blistering guest solo from OPETH's Fredrik Åkesson on "Arcana Imperii", "Ámr" is another evolutionary leap from one of metal's most remorselessly forward-thinking protagonists. "It's just lovely to work with Tobias," says Ihsahn. "I know that he can technically handle anything I throw at him. But more importantly, when I say like; 'I want this to feel like the vacuum between words in a conversation with Hannibal Lecter,' he will say, 'Yeah, I get that!' [Laughs] So for him, it's not about showing off, it's always about relating to the vibe. With Fredrik, we met first time in Oslo, when I did my debut solo show as support to OPETH and later we've hung out on different festivals when we happen to play the same day. Last time in Japan when we played there with EMPEROR and OPETH. We were talking about guitars and I said, 'Not to kiss up to you or anything, but you're absolutely one of my favourite players, so some day I might call you for a guest solo…' and he says, 'I'm in!' He did a fabulous job." As with all of Ihsahn's solo albums to date, "Ámr" possesses its own unique atmosphere; a palpable sense of tension and unease that infuses even the album's most melodic moments with heightened drama and otherworldly menace. But despite its often-claustrophobic feel, this is very much an album of beautifully crafted and shrewdly arranged songs. Although as dark and intense as anything he has conjured before, both the depth of sonic texture and the clarity of his overarching vision are more impressive than ever. "Knowing that the form would be somewhat similar to what I did on the previous album, and given that I write stuff in a certain way, I wanted to change the wrapping this time," Ihsahn notes. "So instead of going with my go-tos of strings and orchestration, I focused on analog synths and more in-your-face sounds. It goes back to the beginning of EMPEROR, when we brought in strings and horns inspired by orchestral movie scores by John Williams and Jerry Goldsmith, but at the same time we loved all those eerie synth soundtracks of, for example, John Carpenter's 'Halloween'. I've also been listening to some contemporary R&B and hip-hop stuff with those deep, deep 808s. It's just somehow darker than a lot of metal or black metal. It has a depth and an energy to it that I find captivating, so I wanted to explore those arrangement styles as well." Another bold stride into uncharted territory, Ihsahn's seventh solo album is the legendary Norwegian's most eclectic and challenging to date. Morphing fluidly from mellifluous art rock ambience to vicious extreme metal, covering all points in between, the likes of grandiloquent opener "Lend Me The Eyes Of The Millennia" and the wild, melodic melancholy of "Sámr" blend seamlessly with ornate, progressive metal monoliths like "In Rites Of Passage" and the immaculate, climactic "Wake". Drenched in evocative synthesizers and brimming with skewed-but-irresistible riffs, "Ámr" is both Ihsahn's most accessible record to date and his most extreme departure from his black metal roots. "Every album I intend to make the darkest album ever," Ihsahn says. "I never set out to make anything more melodic or accessible. However, growing up on '80s metal, plus having a rather wide range of musical influences, I often end up with quite contrasting elements. This is my seventh solo album, so in the end it really comes down to methods and perspectives that keep me exited and fired up about what I'm working on. If I'm not excited about it, I can't expect anybody else to be!"